Get the Polycom Trio 8800 IP/VoIP conference phone that's ready to roll with your Microsoft unified communications platform. This unit comes with a Polycom UCS Skype for Business license. It's ready to install with Office 365 Cloud PBX and Skype for Business when you open the box. 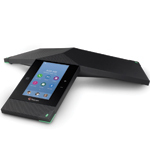 Polycom RealPresence Trio 8800 is a conference phone that pushes the envelope of technology. Start with Polycom's incredible sound. Polycom conference phones are famous for giving you the best sound quality on the market, and the Trio continues this tradition. Polycom has developed specialized audio technology including NoiseBlock and their enhanced HD Voice. The Polycom Trio is a stylish phone with a bright 5" touchscreen as your primary interface. Use the phone just like you would use a smartphone. With three cardioid microphones giving you 360° coverage and a very broad speaker frequency range of 100 Hz to 22 kHz, you're going to be sending and receiving natural audio. Bluetooth and NFC support makes pairing your devices a cinch. When you add a Polycom RealPresence Trio Visual+ accessory and a camera, you're able to use the Trio as the hub for a video conferencing and content sharing collaborative ecosystem.